1 AVAILABLE – Call for Shipping Information. 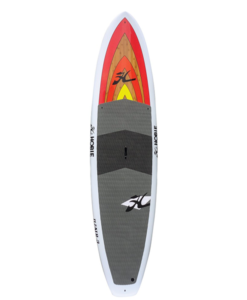 The FX 12’6″ Pro is the outcome of testing by some of the top SUP racers to create the ultimate cross-over open water race board for today’s mixed condition races. * Arizona’s largest inventory of quality name brand paddleboards and accessories. * Knowledgeable and friendly customer service. * FREE SHIPPING within the continental US on inflatable SUP’s, swimwear, and accessories. Riverbound Sports has hand selected some of the best paddleboards in the world and is proud to partner with quality brands such as Infinity SUP, Starboard SUP, SIC Maui, Yolo Boards, Hobie SUP, Red Paddle Co. and more. Whether you are looking to paddle the river, race that podium finisher, tour the lake, or head to the beach to catch some waves, we have you covered. The FX 12’6″ Pro is the outcome of testing by some of the top SUP racers to create the ultimate cross-over open water race board for today’s mixed condition races. Starting with the race lines of the X-Series SIC added more volume and rocker to the bow for cross chop. The rounded out rails allows the FX to slice through side winds and flattened the deck for getting in and out of surf for races such as Battle of the Paddle and Pacific Paddle Games. The end result is one of the most versatile crossover boards on the market. Fast, technical and able to handle a variety of water conditions. CONSTRUCTION: Standard FX-12.6 Single Carbon Composite (SCC) features include a full wrap bi-axial carbon, Innegra™ tip, rail and tail reinforcement, PVC reinforced deck for the ultimate in strength, weight and stiffness. Equipped with croc skin EVA deck pad, U.S. standard fin box / Carbon 12K Weedless 8.3” fin, Gore-Tex breather valve, EZ-Grab handle, and single leash plug. Our SCC +Innegra™ construction is a light weight CNC/EPS core with a full wrap bi-axial carbon fiber glass internal layer. The SCC features an Innegra™ tip, rail and tail reinforcement area and 2-Layers of bi-axial glass rail reinforcement for extra durability. The 3mm high-density PVC deck reinforcement with a crocodile textured eva deck pad is grippy and comfortable for long paddles. This construction also features our ez-grab carry handle and gore-tex breather vent. Join our newsletter for our latest specials and events near you! Sign-up now to learn about discounts and events - don't miss the fun!